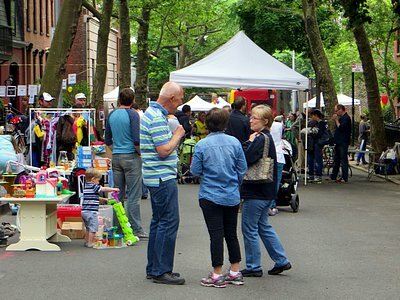 We have word from Ben Bankson (in striped shirt in photo, at last year’s Fair) that this year’s Willowtown Spring Fair will be Saturday, May 17 from noon to 5:00 p.m., on Willow Place (between Joralemon and State streets). This year’s Fair will feature a pet parade. Participants and pets should assemble in Adam Yauch Park at 3:15. From there, professional dog walker Nadine Bilgore will lead a procession around Willowtown, with a pause for karaoke led by DJ Domingo Ampil. At the end of the march, Rocco & Jezebel will provide bags of treats. Willowtown resident historian and author Amity Shlaes will sell copies of the new graphic version, with drawings by Paul Rivoche, of her 2007 book The Forgotten Man: A New History of the Great Depression. In addition to the karaoke, live music will be provided by The Five Deadly Venoms, a Brooklyn-born and based bluegrass band named for a Kung Fu movie. There will be food from Iris Cafe, a wine tasting presented by Waterfront Wines & Spirits, a tug-of-war, three legged races for adults and kids, a jumpy castle, and more. Will Bee Bop be leading the pet parade? And will Cathy show up to get her cat, or is she still trolling the internet for donations? FYI BeeBop IS STILL MISSING! The reward is $2,000 cash and that BeeBop can be picked up within 24 hours. Thanks for putting BeeBop’s name up for us!